Lend a touch of softness and comfort to your space with this lovely fauxfur throw pillow. Super soft material is fun to touch and rest on, and the gorgeous colors deliver a fun, inviting accent for any space. Dimensions 12.0 In. X 8.0 In. X 10.0 In. Unbelievably soft and blends in perfectly with the color scheme of my office area. When shipped, the pillows will be a little flattened out. You can easily fluff them up once out of the packaging. Absolutely love these throw pillows. Thanks Overstock! This is exactly what I was looking for. They are great quality and very soft. They look lovely as throw pillows in my bedroom. I would recommend these pillows. Would also make great throw pillows for a sofa. 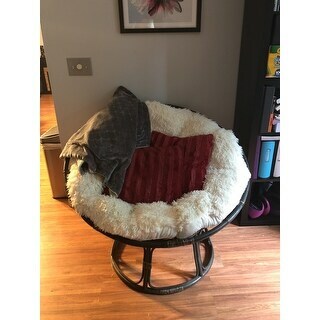 The faux fur pillows are a good buy, Made well and soft. The grey color was just right...not too dark, not too light. I would recommend to anyone looking to add some texture to their decor. 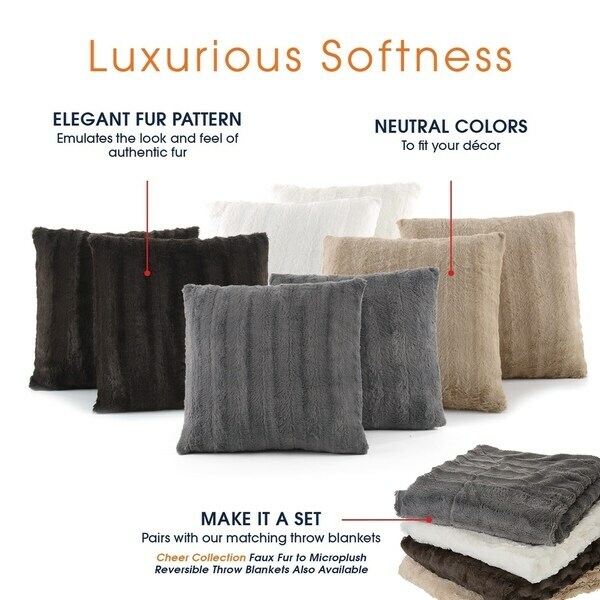 I ordered the set of 2 pillows in gray and they are made of a very pretty faux fur material. The gray is a dark shade, not charcoal/black but an actual gray color, more of medium to dark than light to medium. I would definitely recommend these pillows for adding to any room decor. Pillows are very cozy and accent my living room space perfectly. My friends love the set so i refuted them to overstock. The price was very satisfying as well, many colors to choose from too. These throw pillows are very soft and beautiful! I love them. Very soft pillows. Shiny on one side and soft on the other. Good quality and super soft on both sides! Not what I expected!!!!! I would not recommend to anyone! Just ok. Smaller than I expected and not as lux as I was hoping. Bought these in white. Good amount of stuffing, but the faux fur itself doesn't really stand the text of time. It got matted down. Wouldn't buy these again. Looks beautiful! Soft! Washes well! Great asset to my living room set! I love these pillows. They are so soft and have two different sides for different looks. Too small and need more filling. Nice texture; a little pricey. "Is the white pillow pure white or more of an off white color?" BOON Rabbit Faux Fur Throw & 2 Pillow Combo Set, 50" x 60" & 60" x 80"